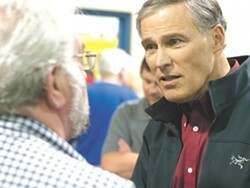 At a town hall on Monday evening, Gov. Jay Inslee announced his plan to pump $2.3 billion into public K-12 schools, colleges and teacher workforce training in the next biennium. Inslee's education plan would fulfill the state Supreme Court's McCleary mandate to fully fund basic education a year earlier than the court-set deadline; freeze college tuition increases for two years; and restore teachers' cost-of-living pay raises. You read his full plan here. What his plan doesn't do is cover the full cost of the voter-approved class-size reduction initiative, which comes at an estimated $2 billion price tag. Instead, his proposal dedicates $448 million in new spending to reduce K-3 class sizes, as required by the court's McCleary decision. "What we've decided here is that we cannot fully fund [the class size initiative] in this first biennium, so what we've chosen to do is fully-fund the K-3 portion of that this biennium," David Schumacher, director of the state's Office of Fiscal Management, told KPLU. "There's just simply not enough money available." There's no word yet on where or how the governor expects to get the money to pay for his plan. He'll release his entire budget proposal on Thursday.